Posted: Mon Mar 04, 2019 7:14 pm Post subject: 993 C2 to 997 GT3??? So I’ve had my C2 for 8yrs and I love it to death. My car is (has been 🙄) perfect for this and it’s all I love about it - proper A/B road car. It’s just that the game has moved on sooooo much I’m feeling a bit slow. Go for it, the 993's are great fun in their own right, but the modern GT3 996 or 997 will hammer them, but is a very different driving experience. The gt3 market appears to be at an all time low point, so a good opportunity to buy before things pick up again. Life is short so go for it while we can still use the roads up here. I am not sure if I can really add much but...I moved from a 997.1 C4S to a 993 C2 and the main reason for my change was that I didn't feel like I was truly driving (entirely subjective, of course) unless I was truly gunning it...in which case one finds oneself in licence losing territory mighty fast indeed. I'd say stick with the C2 on that basis, but GT3s are lovely beasts indeed. As you say, 1st world problems! If your 993 is in good condition, history, straight etc its gonna sell no doubt. Could you beg, steal and borrow the money to buy a 997 GT3 to see if you could live with it? I totally get that point, the C2 is incredibly rewarding at the limit, so much fun... it’s just not that quick!! Great as the 993’s were (and I LOVE the 993) the GT3 has that ‘event’ when driving. Try a 996 and 997, the 997 maybe to civilised for you.. I took my C2 to 150, it felt fast to me too fast.. just took a bit longer to get there than the GT3. Im in process if PSS10 and all the running gear getting installed so I imagine its going be sooooo planted and solid when done. As an ex owner of numerous 996 GT3's, a couple of 997 GT3's and a 993 RS, I'd suggest a 997 GT3 solely for road use, will be a step too far. For sure, on the odd occasion such as an Applecross thrash or a road to Mallaig thrash, the newer car will annihilate a 993, but ask yourself, just how often do you get to use and experience that massive superiority ? A Mk1 996 GT3, and I'd chose the Mk 1 specifically for a reason, would make a lovely and sensible upgrade from a 993 (I did the same, albeit I went from a 993 RS to the Mk1 GT3). The 996 interior retains some of the old school, air cooled charm that's sadly lacking in the 997, the 996 interior is more cocoon like, and thus a more intimate place to be when compared to that of the newer car. Just as importantly the Mk1 GT3 has softer spring and damper rates than the Mk2, it's thus more usable and better suited to our poorly surfaced roads IMO, but it's also nicer to drive than the Mk2 due to that increased compliance. The Mk2 has the better engine, more powerful and more free revving than the Mk1's at the top end, but after the 993, you'll find the engine in the Mk1 more than quick enough and it's incredibly characterful, and whilst it's different in character to the aircooled engines, it's crude Variocam system makes its power delivery special, as does it's lumpy tickover when hot. IF you feel need for parity with a Mk2 from a power perspective, fit a decent exhaust system and manifolds (M&M or Cargraphic, though I'd go for the former) and take it to Wayne Schofield at Chip Wizards, he'll free up another 40-45hp and give you an engine that's every bit as quick as the Mk2, but with a soundtrack and character to die for. Go and test drive as many cars as you can, and once you've found the best Mk1 you can, get it inspected by one of the GT watercooled specialists such as Fearnsport. As with any secondhand car, there are some dogs out there, and some owners can be less than transparent about their cars shorcomings when it comes to selling them. Buy a good one with suspension, brakes, tyres, clutch and gearbox in fine fettle/correctly adjusted and you'll have something very special to drive and cherish for many years to come. I had a 996GT3 Mk2 Clubsport, I put KWv3 coilovers on it, it was a great car, incredibly capable especially on track, I took it to the ring and a number of UK tracks. However on the road it was compromised to the point I eventually decided I needed something else, something more and I don't mean speed/power. I yearned for that special feeling which for me was missing with the 996 GT3, the GT3 engine is a masterpiece, I'm glad I scratched the itch but I yearned for the shape, feel, the smell and the sounds of a classic 911. My advice is be careful, there will always be something faster out there, even if you do upgrade. Replacing your 993 based on gaining some extra speed may well be offset by losing so much of what makes a 993 so special. I often wonder how slow a driver I must be as a 993 is plenty quick enough for me,especially on the Queens highway! I could imagine if you were a track day fiend you might want something faster. Stick with your air cooled ,they are only going to get rarer and harder to find a good one. Look at Jackals Forge.he managed to keep up with some exotica in his old yellow banger! If you've not had the suspension configured by somewhere like Centre Gravity (new parts are half the answer, they need setting up right) and if you've not have Wayne Schofield at Chipwizard work his magic, you should try those before moving on. IMHO. So we're comparing a 993 Carrera (albeit a cherished car) with a 997 GT3? I'd understand if you were thinking twice about moving to a 997 Carrera, which is a younger, larger, watercooled car, but the GT3 is on the next level in terms of technology, chassis and engine. I'd say, you should go for it. Posted: Tue Mar 05, 2019 2:00 pm Post subject: Re: 993 C2 to 997 GT3??? As others are saying, be careful. I regretted selling my 964 and ended up back in an air cooled car. I like the GT3 a lot and almost went that way (997.1) instead of the 993 but ultimately charm and beauty won over speed and lower running costs. Up on those fabulous roads in Scotland, sun shining, sunroof cracked open a little (probably with the heater on!) listening to the engine the 993 seems perfect to me. Wouldn't really bother me if someone in a McLaren was covering ground quicker. To be honest I doubt a 996 GT3 would be covering ground that much quicker on those roads than me? 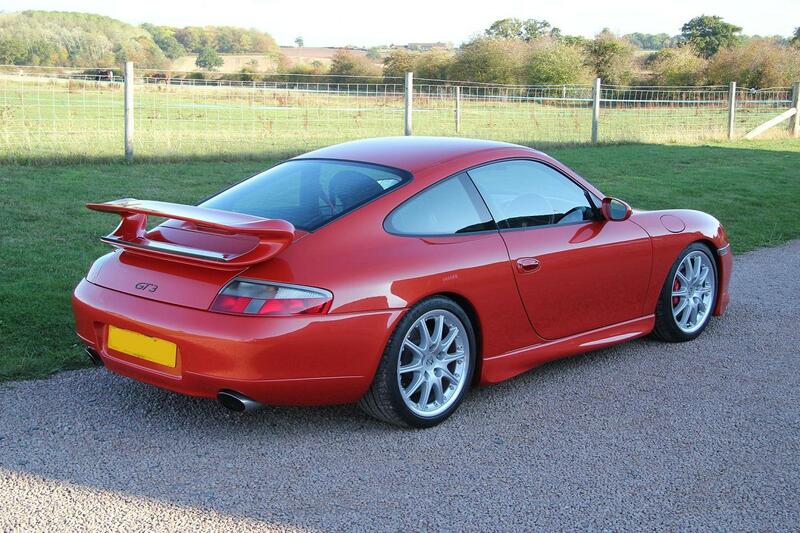 This^ FFS.... now I’m looking at 996 GT3’s ! Fanatastic post and thanks so much guys..
I’m no fan of “top end” speeds - it’s the turn in, balance and accelerating out that I love. Posted: Tue Mar 05, 2019 7:33 pm Post subject: Re: 993 C2 to 997 GT3??? I have a 993 C2 totally unmodified and a 997.1 GT3 comfort. I find the GT3 to be much harder to live with and more expensive to maintain. In the end though there are going to be pros and cons. One thing I would say is if you want a fast road car the GT3 has a very peaky power band and lacks mid range grunt that you often would want on the road. I hear that. My C2 is a high days and holidays car and bar the very occasional hack into the office on a sunny half day is just for driving... no need for “too much” comfort if that makes sense. I’m hanging up the GT3 want while I make sure I’ve made the best (for me anyway) of my 993 while maintaining the return to stock option.